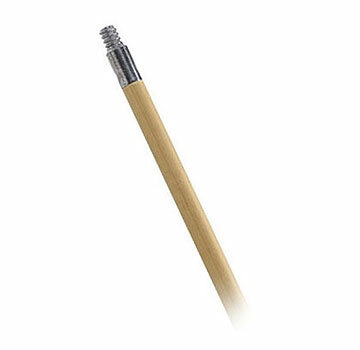 PRODUCT: 5 Foot Hardwood Handle with Metal Threaded Tip. Strong 15/16" x 60" long #1 Grade hardwood handle, Lacquered Finish with cast metal threaded tip. For use with paint rollers and brooms. Price/Each. DESCRIPTION: #1 grade 15/16" diameter x 60" long, lacquered hardwood handle, #1 hardwood, with cast metal threaded tip. For use with paint rollers and brooms.